The phone will be available in 128GB and 512GB storage variants and will be priced at Rs 67,900 and Rs 84,900, respectively. 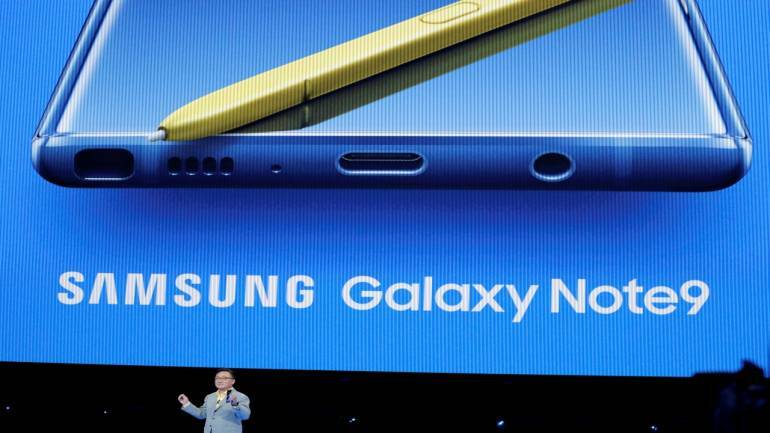 South Korean tech giant Samsung launched its latest and its most powerful flagship smartphone yet -- the Galaxy Note 9 -- in India on Wednesday, August 22. The much-anticipated device was unveiled globally earlier this month. The phone will be available in 128GB and 512GB variants and will be priced at Rs 67,900 and Rs 84,900, respectively. Interested buyers can purchase Samsung Galaxy Note 9 on both online as well as offline platforms. The device is available on Samsung's official website and at leading online platforms such as Paytm Mall, Amazon, Flipkart, Tata CLiQ, and Croma (online as well as offline store). As a part of the launch, the company is rolling out a whole range of offers, including a Rs 6,000 cashback combined with a no-cost EMI for HDFC credit card users, zero-cost EMI starting from as low as Rs 4,140.68 per month on leading credit cards and Bajaj Finserv, a Rs 6,000 cashback on Paytm if a user purchases the device from Paytm Mall. In addition to this, the phone maker is offering the Samsung Upgrade Offer, wherein it will provide a discount of up to Rs 6,000 on a select list of smartphones if a buyer purchases the device from Samsung Shop. Separately, telecom giant Airtel is also offering the device for Rs 7,900 provided one subscribes to Airtel's Rs 2,999 plan for the next 24 months. As part of the offer, Airtel will provide a user with up to 100 GB of data per month, along with a one-year subscription of Amazon Prime, free subscription to Airtel TV, the Wynk app and Airtel's in-house protection plan for the new device. The biggest selling point of the Samsung Galaxy Note 9 is the improved S Pen stylus. The new S Pen comes with a host of features that will benefit not only a corporate user, but also a regular day-to-day user. With embedded Bluetooth Low Energy (BLE) module, the stylus will now also act as a remote control for the smartphone using Bluetooth. It can now control video playback on the YouTube app, move slides back and forth during a presentation, or scroll through images in the phone's Gallery. However, the most attractive function of the stylus is its ability to control the smartphone's camera. Users can now click picture using the smartphone's stylus without even holding the phone in their palm. Moreover, the stylus can also switch between the phone's front and rear cameras while shooting. The Samsung Galaxy Note 9 comes with a massive 6.4-inch Super AMOLED Quad HD+ screen with a resolution of 1440*2960 pixels and an aspect ratio of 18.5:9. The device sports extremely thin bezels and the screen has a pixel density as high as 516 ppi with a 83.4 percent screen-to-body ratio. The HDR10 compliant screen comes with Corning Gorilla Glass 5 to protect itself from scratches and such. The smartphone runs on a Exynos 9810 octa-core processor, which clocks up to 2.7 GHz. The CPU is supported by two RAM configurations of 6 GB or 8 GB, with storage options of 128GB and 512GB, respectively. To perform graphic-intensive tasks, the device comes with Mali-G72 MP18 GPU. It supports memory expansion of up to 512 GB via a microSD card, which will use up the SIM 2 slot. The phone also features Samsung DeX, with which you can convert your Galaxy Note 9 into a computer monitor with just an HDMI connector. DeX also converts your Galaxy Note 9 into a streaming device. On the camera front, Galaxy Note 9 sports a dual camera setup with a 12 MP Super Speed Dual Pixel primary wide angle camera and a 12 MP telephoto lens. While the primary camera has dual aperture rate of f/1.5 and f/2.4, the secondary telephone lens comes with an aperture rate of f/2.4. The lenses are capable of an optical zoom of two times or a digital zoom of up to 10 times. On the front, the device sports an 8 MP camera with an aperture rate of f/1.7. Some salient features of the camera include PDAF, dual video call facility, Auto-HDR, AR Emoji feature, capability to record videos with 2160p resolution at 60 fps, 1080p resolution 240 fps or 720p resolution at 960 fps, dual-video recording, etc. The Samsung Galaxy Note 9 is powered by a massive 4,000 mAh battery and runs on Android 8.1 Oreo operating system. Other features include Iris scanner, rear-mounted fingerprint, accelerometer, gyro, proximity, compass, barometer, dual-band Wi-Fi, Bluetooth v5.0 (LE up to 2 Mbps), 3.1 Type-C 1.0 USB connector, NFC, GPS, A-GPS, GLONASS, BDS, GALILEO, 3.5mm audio jack, Bixby voice assistant, water and dust resistance rated at IP68, NFC and MST based payment modes. The device has dimensions of 161.9 x 76.4 x 8.8 mm and weighs slightly on the higher side at 201 grams. It comes in three colour variants -- Midnight Black, Ocean Blue, Metallic Copper. However, the metallic copper colour scheme is available only for the 128 GB variant.